Finding a fast VPS that will be reliable and that won't break the bank is no easy task. In the Screener you can review more than 60 VPS plans from 25 providers with their prices, performance and specifications all in one page. Each VPS is tested in depth and graded in 5 categories including CPU power, disk IO speed and network speed. The Screener lets you order plans by the category grade that most matters to you, filter by price, cpu cores or disk space. That's the easiest way to find the VPS that matches your requirements. Cloud server performance usually improves when the price and specs go up. But a VPS that is twice as expensive is rarely twice as fast. Some cheap VPS are extreme bargains, the best ones deliver an amount of power per dollar spent that can't be rivalled by their more expensive peers. But some low price deals are just traps to attract as many uninformed customers as possible. The Price Weighted Screener helps you find the good ones. It shows the plans performance adjusted for their price, the plans that are both fast and cheap are at the top of the list. Do you simply want to review VPS prices and their specs? Then head to the plan prices page, find the cheapest VPS or the one with the most memory, the most CPU cores or the largest disk space. Cloud storage is essential to share or move data around VPS and it is critical to backup your data. But there are many types of storage to choose from, the options vary slightly between providers making them hard to compare and the pricing is often complex. The Cloud Storage Pricing page explains and summarizes everything. Storage prices are collected from all providers that offer storage and are presented in a way that facilitates comparisons. Web Server: compare the Web and Remote Timings tests results. CI testing, CPU intensive tasks: compare the Sysbench CPU and Endurance test results. File server: compare the Sysbench DIsk IO and Network Transfers test results. For a side by side high level comparison of 2 providers, go to the main comparison page. If you're curious about the CPU models that providers are running inside of their VPS, then take a look at the List of CPUs used by each provider. But what kind of performance can you get out of a specific CPU model? The CPU model list by Sysbench performance has the answer, it shows the performance level that be reached for each CPU model. If only this could all be presented in a simple chart! 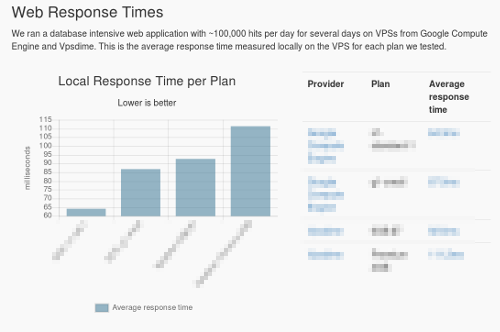 No problem, you can correlate VPS plans, performance, stability metrics in the Metrics Correlation Chart. Every few days, VPSBenchmarks purchases a new VPS and runs a live high traffic website on it. We collect web server response time, remote response times and system metrics while it runs. Then we run a full suite of Sysbench tests to measure CPU, disk and memory performance. And as if it was not enough, to make sure the provider is not going to steal your resources when you start using them, we run a 24 hour sustained CPU endurance test. The full set of tests is called a "trial". You can follow the progression of the tests while they run by exploring the Trials page.